We will be checking your items at drop-off to ensure that they are acceptable. We want to maintain high standards with our sale items, so your main goal as a consignor is to make sure that each of your items is of a high quality. If an item does not meet our quality standards, it will not be placed on the sales floor, and it will be returned to you at the end of the sale. Rule of thumb: If you wouldn't buy it for your child - don't consign it!! Infant, Children, or Junior's Clothing: new or gently worn[^4], seasonally appropriate (Spring / Summer clothes for March sale; Fall / Winter clothes for August sale). All clothing MUST be on hangers. Shoes: Limit of 10 pairs; excellent condition only -- (see tagging page for packing instructions). Only designer flip-flops accepted (not Target, Old Navy, etc). No houseshoes. Halloween Costumes: must be appropriate for children. Only accepted during the Fall (August) sale. Baby / Children's Furniture: Cribs (no drop-side or recalled items), changing tables, rocking chairs/gliders, bassinets, mattresses, toy boxes, bookshelves, etc. Baby Equipment: strollers, joggers, bike trailers, pack-n-plays, baby swings, jumperoos, walkers, high chairs, booster seats, exer-saucers, bouncy seats, doorway jumpers, etc. Bedding Sets: should be placed in a Ziploc Big Bag with all items together. Baby/Child Feeding Accessories: bottles, sippy cups, dishes and utensils, nursing pillows, etc. Accessories: hairbows, headbands, belts, hats, etc. Nursery Needs: infant bathtubs and seats, Bumbos with restraint belt (will not be sold without belt), diaper pails, potty chairs, wipe warmers, changing pads, slings/carriers, step stools, diaper bags, baby monitors, baby gates, bed rails, baby sleep positioners, etc. It is the consignor’s responsibility to check all of your items for recall BEFORE you consign them. We will NOT accept items that are under recall. Please visit http://www.cpsc.gov/en/Recalls/ to search if your item has been recalled. 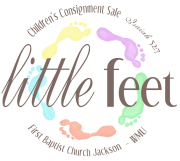 Every consignor will be required to sign a “recall waiver” when signing up to consign with Little Feet. Little Feet reserves the right to limit the number of items that we accept at any point in time during item entry. Limiting items will only be done in the event of a lack of space to display these items properly during the sale. Once our 50,000 item limit has been reached, we will evaluate what has been entered and will most likely reopen the site for more clothes, strollers, carseats and swings. This will be subject to the Little Feet team's discretion on space available.